The ATR 72 is a twin-engine turboprop, short-haul regional airliner developed and produced in France and Italy by aircraft manufacturer ATR (Aerei da Trasporto Regionale or Avions de transport régional), a joint venture formed by French aerospace company Aérospatiale (now Airbus) and Italian aviation conglomerate Aeritalia (now Leonardo S.p.A.). The number "72" in its name is derived from the aircraft's standard seating configuration in a passenger-carrying configuration, which could seat 72–78 passengers in a single-class arrangement. During the 1980s, French aerospace company Aérospatiale and Italian aviation conglomerate Aeritalia merged their work on a new generation of regional aircraft. For this purpose, a new jointly owned company was established, ATR, for the purpose of developing, manufacturing, and marketing their first airliner, which was later designated as the ATR 42. On 16 August 1984, the first model of the series, designated as the ATR 42-300, performed the type's maiden flight. During the mid-1980s, the ATR 72 was developed as a stretched variant of the ATR 42. On 27 October 1989, Finnish airline Finnair became the first airline to operate the type in revenue service. The ATR 72 has also been used as a corporate transport, cargo aircraft, and maritime patrol aircraft. To date, all of the ATR series have been completed at the company's final assembly line in Toulouse, France; ATR benefits from sharing resources and technology with Airbus SE, which has continued to hold a 50% interest in the company. Successive models of the ATR 72 have been developed. Typical updates have included new avionics, such as a glass cockpit, and the adoption of newer engine versions to deliver enhanced performance, such as increased efficiency and reliability and reductions in operating costs. The aircraft continues to share a high degree of commonality with the smaller ATR 42. The ATR 42 and ATR 72 have been produced side-by-side for decades. During the mid-1980s, ATR sought to introduce a larger airliner with capacity. This new regional airliner, designated as the ATR 72, was directly developed from the earlier ATR 42 and continued to share many commonalities with it; the principal difference between the two airliners was an increase in the maximum seating capacity from 48 to 78 passengers. This was principally achieved by stretching the fuselage by 4.5 m (15 ft), along with an increase of the wingspan, the use of more powerful engines, and increased fuel capacity by about 10%. On 15 January 1986, the launch of the stretched ATR 72 programme was announced. On 27 October 1988, the first prototype performed its maiden flight; one year later, on September 25, 1989, the ATR 72 received airworthiness certification from the French Directorate General for Civil Aviation. During the following month, on 27 October 1989, Finnish airline Finnair became the first airline to introduce the aircraft into service. Since the ATR 72 is assembled on the same production line as the smaller ATR 42, along with sharing the majority of subsystems, components, and manufacturing techniques, the two types support each other to remain in production. This factor may have been crucial as, by 2015, the ATR 42 was the only 50-seat regional aircraft that was still being manufactured. Within the ATR company, various organisational changes were implemented. On 10 July 1998, ATR launched its new Asset Management Department. In June 2001, EADS and Alenia Aeronautica, ATR's parent companies, decided to reinforce their partnership, regrouping all industrial activities related to regional airliners into the ATR consortium. On 3 October 2003, ATR became one of the first aircraft manufacturers to be certified under ISO 9001-2000 and EN/AS/JISQ 9100, the worldwide quality standard for the aeronautics industry. During July 2004, ATR and Brazilian aircraft manufacturer Embraer announced a co-operation agreement on the AEROChain Portal for the purpose of delivering improved customer service. During April 2009, ATR announced the launch of its 'Door-2-Door' service as a new option in its comprehensive customer services range. Since 2008, ATR has been a participant in the European Clean Sky Joint Technology Initiative. On 8 July 2015, a ATR 72-600 'green' technology demonstrator performed its first flight; the demonstrator was used for testing new composite materials for insulation, air conditioning systems, electrical distribution systems, and energy dispersal modifications to evaluate their effect on the aircraft's overall efficiency as a contribution to the Clean Sky initiative. ATR's senior vice-president for engineering Alessandro Amendola indicated that the elimination of all uses of bleed air was a key aim in the designing of an all-electric architecture as well as improving engine efficiency; the minimising of peak electrical loads was also a stated priority. During March 2016, a second round of flight trials dedicated the testing of all-electric systems architecture using the demonstrator was completed; analysis is set to continue. The current production version is the ATR 72-600 series. On 2 October 2007, ATR CEO Stéphane Mayer announced the launch of the −600 series aircraft; the ATR 42–600 and ATR 72–600 featured various improvements to increase efficiency, dispatch reliability, lower fuel burn and operating costs. While broadly similar to the earlier -500 model; differences include the adoption of improved PW127M engines, a new glass cockpit, and a variety of other minor improvements. As a consequence of strong demand for the -600 series, ATR decided to invest in the establishment of a second, more modern final assembly line and acquisition of more hangar space at its Toulouse site, along with a new large completion and delivery area; overall, the manufacturing operation expanded to four times the footprint that it had in 2005. Speaking in October 2015, ATR CEO Patrick de Castelbajac stated that the firm was set to produce in excess of 90 aircraft that year, and that the new manufacturing facilities could support a production rate of up to 120 per year. At the time, the company had a backlog of orders for 300 aircraft, sufficient for three years of production. During 2017, a new in-house financing and leasing division was established by ATR in order to offer customers a greater degree of support and expand the company's range of services. Considerable emphasis has been placed upon the continuous development of ATR's aircraft models. Speaking at the Farnborough Airshow in July 2016, the CEO of ATR Patrick de Castelbajac stated that the company was currently examining the possibility of replacing the current Pratt & Whitney Canada PW127 engine with either a new offer from P&WC, or a GE38 derivative from GE Aviation. Although expressing satisfaction with the PW127 engine and its supplier, Castelbajac noted the design's age and the need to remain competitive with the latest regional jets. To be a worthwhile exercise, any re-engine exercise would require a 15 per cent improvement in fuel-burn and 20-25 per cent reduction of direct maintenance costs. Additionally, Castelbajac sees the potential re-engine as a "bridge" to the eventual development of a larger 100-seat aircraft. During the mid-2010s, reports emerged that the development of a further stretched 90-seat ATR model was under consideration as well; allegedly, shareholder Airbus was relatively unenthusiastic on proceeding with such a development, while Airbus CEO Fabrice Brégier favoured a focus on resolving manufacturing issues. However, in January 2018, ATR's parent company Leonardo announced that the 100-seat program has been formally brought to a close. The ATR 72 is a turboprop-powered regional airliner, capable of accommodating a maximum of 78 passengers. It is powered by a pair of Pratt & Whitney Canada PW100 turboprop engines, which drive an arrangement of four or six-bladed propellers supplied by Hamilton Standard. Earlier models of the ATR 72 are equipped with the older PW124B engine, rated at 2,400 shp, whilst later-built aircraft are powered by the newer PW127 engine, rated at a maximum of 2,750 shp to achieve improved "hot and high" takeoff performance. It employs a carbon-fibre tip wingbox for 30% of the wing weight and a 20% weight reduction. In a standard configuration, the aircraft does not have an auxiliary power unit; when present it is installed within the C4 cargo section. Most operators of the ATR 72 equip their aircraft with a propeller brake (referred to as "Hotel Mode") that stops the propeller on the No. 2 (right) engine, allowing the turbine to continue running and provide both airflow and electrical power to the aircraft while on the ground. In the majority of configurations, passengers board the ATR 72 using the rear door, a relatively unusual configuration for a passenger aircraft, while the front door is typically used for the loading and unloading of cargo; early customer Finnair intentionally ordered its ATR 72s with a front passenger door so that it could utilize the jet bridges at Helsinki Airport, while operator Air New Zealand's standard rear door aircraft can use jet bridges at airports with this equipment. While passengers are boarding or disembarking the aircraft, a tail stand is set into place as standard procedure to guard against the aircraft nose lifting off the ground. 2011 was a record-breaking year for sales at ATR. According to ATR's CEO Filippo Bagnato, sales had continued to grow during the Great Recession despite the downturn experienced by most aviation companies as "fuel consumption that can be half that of the alternatives and [with] lower maintenance costs". Bagnato noted the strength of Africa as a market for the type, as well at the firm's aircraft being capable of serving destinations that would otherwise be inaccessible with other aircraft due to the austere conditions of many airstrips and runways in the region, as well as the ability to operate autonomously without any reliance upon ground support equipment. For 2013, ATR claimed a 48 percent global market share for regional aircraft deliveries between 50 and 90 seats (comprising both turboprops and jets), making it the dominant manufacturer in this market segment. That same year, during which firm orders for 10 ATR 42-600s and 79 ATR 72-600s were recorded, leasing companies were responsible for 70 per cent of these; according to ATR's CEO Filippo Bagnato: "Years ago, we were not even considered by the lessors; now they see ATRs as a good investment". Several major leasing companies operate their own ATR fleets, such as Dubai Aerospace Enterprise (DAE), who placed an order for 20 ATR 72s along with options for another 20 in February 2014, and Nordic Aviation Capital (NAC), who ordered a fleet of 30 ATR 72s during June 2013, along with options for up to 55 further airliners. 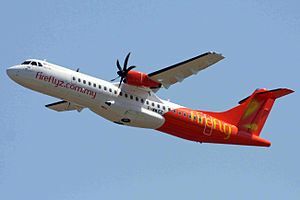 Placing their first order during 2011, by December 2012, Singaporean leasor Avation had a combined total of 20 ATR 72s on order; by February 2016, the number on order for Avation had risen to 35 aircraft. During May 1997, ATR achieved their first breakthrough sale in China, placed by operator China Xinjiang Airlines and the Civil Aviation Administration of China (CAAC). By 2013, while the Asia Pacific region had comprised the majority of ATR's sales when geographically ranked; however, orders from Chinese airlines remained elusive; Bagnato ascribed this anomaly to local market conditions dictating the typical use of larger aircraft, as well as a Chinese government policy of imposing high tariffs on the import of foreign-built fixed-wing aircraft. During late 2014, ATR set up a new office in Beijing and hired several former Airbus sales personnel with the aim of launching the type in the Chinese market. ATR believed that many of the already-flown routes did not suit larger 150-seat aircraft; however, of the roughly 2,600 commercial aircraft flying in China at that time, only 68 had a capacity of less than 90 seats and of these, fewer than 20 were powered by turboprop engines. In response to airlines often wanting to replace their early production ATR models with the latest generation ATR series, as well as to answer demand from cargo operators for the type, ATR has operated two separate dedicated freighter conversion programmes, known as the Bulk Freighter (tube version) and the ULD Freighter. Both conversions involve complete stripping of furnishings along with the addition of floor strengthening, new window plugs and 9g restraining nets, six additional longitudinal tracks for added flexibility, and an E-Class cabin; the ULD model can accommodate standard ULD-packaged cargo, such as LD3 containers or 88 by 108 inches (2,200 mm × 2,700 mm) pallets, which were loaded via a large cargo door located on the port forward side. Undertaken by a range of companies, such as Alenia subsidiary Aeronavali, Texas-based M7 Aerospace; French firms Indraéro Siren and Aeroconseil, Canadian Infinion Certification Engineering, and Spanish company Arrodisa, by October 2012, in excess of one-fifth of all first-generation ATR 42 and ATR 72 aircraft had already been converted to freighters. During February 2016, ATR signed a deal with flag carrier Iran Air for a batch of 20 ATR 72-600s, along with options for 20 more aircraft and post-purchase services, such as engine maintenance. Made possible by a negotiated relaxation of international sanctions against Iran, during June 2017, a €1 billion Iranian contract was finalised for the 20 airliners; the delivery of the first four aircraft occurred within weeks of the deal being completed. During May 2017, Indian low-cost airline IndiGo has tentatively signed for 50 ATR 72-600, intended for its UDAN regional connectivity scheme; these are to be delivered from the year end for up to 20 by the end of 2018. While primarily used as a civil aircraft, some ATR 72s have been adapted to perform in various military functions, such as utility aircraft and maritime patrol aircraft (MPA). The Turkish Navy, which initially decided to purchase ten ATR 72–500 MPA, later expanded its order to eight aircraft: Two ATR 72–600 TMUA (utility) versions, and six ATR 72–600 TMPA (ASW/ASuW) versions. The armed ATR 72 TMPA variant was developed in cooperation with Turkish Aerospace Industries (TAI), and incorporated additional sensors and mission systems to perform its intended combat role. During 2013, the two ATR 72–600 TMUA aircraft were delivered to the Turkish Navy. The Italian Air Force also selected the ATR 72–500 MP, designated as the P-72A, to serve as a multirole maritime patrol, electronic surveillance and C4 platform. The original Italian requirement for a Breguet Atlantic replacement had also called for ASW and anti-surface warfare (ASuW) capabilities, however, during 2014, the contract was renegotiated to a configuration that excluded these capabilities. An anticipated P-72B variant for ASW and ASuW operations may later be pursued; accordingly, provisions were made to allow for the four P-72As on order to be adapted to the P-72B configuration. By October 2016, the test and evaluation phase for the P-72A was approaching completion; reportedly, the aircraft's communication and navigation equipment and the defensive aids system had been fully tested, while trials of the mission systems were still ongoing. During December 2016, the first pair of P-72A aircraft were delivered to the Italian Air Force. On 8 November 2017, FedEx Express launched the -600 cargo variant with 30 firm orders plus 20 options, in a freighter configuration from the factory. As of September 2018, 187 early variants had been produced with 172 operated by 55 carriers, 365 -500s were delivered with more than 350 in service at 75 operators, 444 -600s were produced and are operated by 74 carriers with a backlog of 231 orders. By then, with more than 60 -500s and 40 -600s in storage, new aircraft leases fell to $130,000 per month from $170,000. The -600 list price of $26.8M is typically discounted by 25% for a $20.1M value, a 2012 aircraft is valued $13.3M and leased $115,000, falling to $10.2M and $100,000 in 2021, a D check costs $0.5M and the engine overhaul costs $0.3-1.0M. Two sub-types were marketed as the 100 series (−100). Initial production variant with front and rear passenger doors, powered by two PW124B engines and certified in September 1989. Initial production variant with a front cargo door and a rear passenger door, powered by two PW124B engines and certified in December 1989. Two sub-types were marketed as the 200 series (−200). The −200 was the original production version, powered by Pratt & Whitney Canada PW124B engines rated at 2,400 shp (1,800 kW). 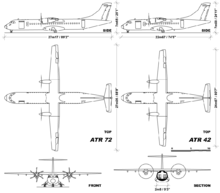 Higher maximum take-off weight variant of the −101, a PW124B-powered variant certified in September 1989. Higher maximum take-off weight variant of the −102, a PW124B-powered variant certified in December 1989. PW127-powered variant certified in December 1992. Certified in January 1997 and fitted with either PW127F or PW127M engines, the −212A is an upgraded version of the −210 using six-bladed propellers on otherwise identical PW127F engines. Other improvements include higher maximum weights and superior performance, as well as greater automation of power management to ease pilot workload. Initial marketing name for the ATR 72-212A. Marketing name for ATR 72-212A with different equipment fit. The −600 series aircraft was announced in October 2007; the first deliveries were planned for the second half of 2010. 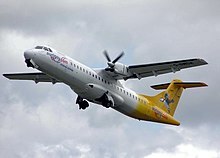 The prototype ATR 72–600 first flew on 24 July 2009; it had been converted from an ATR 72–500. The ATR 72–600 features several improvements. It is powered by the new PW127M engines, which enable a 5% increase in takeoff power via a "boost function" used only when called for by takeoff conditions. The flight deck features five wide LCD screens (improving on the EFIS of earlier versions). A multi-purpose computer (MPC) aims at increasing flight safety and operational capabilities, and new Thales-made avionics provide Required Navigation Performance (RNP) capabilities. It also features lighter seats and larger overhead baggage bins. In December 2015, the EASA approved a new high-density seating layout, raising the maximum capacity from 74 to 78 seats. Bulk Freighter (tube versions) and ULD Freighter (Large Cargo Door). ATR unveiled a large cargo door modification for all ATR 72 at Farnborough 2002, coupled with a dedicated cargo conversion. FedEx, DHL, and UPS all operate the type. Freighter variant of the -600, 8 November 2017 launch with 30 firm orders from FedEx plus 20 options. The first should be delivered in 2020. The ATR 72 ASW integrates the ATR 42 MP (Maritime Patrol) mission system with identical on-board equipment, but with additional anti-submarine warfare (ASW) capabilities. A variant of the −500 (itself a version of the maritime patrol model of the ATR 42–500) is also in production. For the ASW and ASuW missions, it is armed with a pod-mounted machine gun, lightweight aerial torpedoes, anti-surface missiles, and depth charges. They are equipped with the Thales AMASCOS (Airborne Maritime Situation and Control System) surveillance system as well as electronic warfare and reconnaissance systems, enabling the type to perform maritime search and rescue duties. A VIP version of the −500 is available with a luxury interior for executive or corporate transport. During the mid-1980s, the company investigated a 78-seat derivative of the ATR 72. This would have been powered by two Allison AE2100 turboprops (turbofans were also studied for a time) and would have had a cruising speed as high as 330kt. The ATR-82 project (as it was dubbed) was suspended when AI(R) was formed in early 1996. This proposed version targeted the increasing demand of worldwide cargo and express mail markets, where the aim is to allow operators to supplement their passengers flights with freighter flights. In Quick Change configuration, the smoke detector is equipped alongside other modifications required in order to meet the certification for full freight operations. The aircraft was equipped with a larger cargo door (1.27 m [50 in] wide and 1.52 m [60 in] high) and low door-sill height of an average 1.2 m (4 ft), facilitating containerized freight loading. It takes 30 minutes to convert the aircraft on ATR 42, while for ATR 72, it takes 45 minutes. Each optimized container has 2.8 m3 (99 cu ft) of usable volume and maximum payload is 435 kg (960 lb). The ATR 72 has been involved in 46 aviation accidents and incidents including 29 hull losses. Those resulted in 398 fatalities. 30 Jan 1995 TransAsia Airways 4 0 Taiwan, near Taipei crash into a hillside, four crew killed. 21 Dec 2002 TransAsia cargo 791 2 0 Taiwan, near Makung City crash due to icing, both crew died. 6 Aug 2005 Tuninter 1153 16 23 Italy, near Palermo ditch due to fuel exhaustion caused by inappropriate indicators. 4 Nov 2010 Aero Caribbean 883 68 0 Cuba, near Guasimal Icing and bad crew decisions. 2 Apr 2012 UTair 120 33 10 Russia, Tyumen Airport Crash soon after takeoff. Incorrect deicing procedures. 16 Oct 2013 Lao Airlines 301 49 0 Laos, near Pakse Airport Crash into the Mekong while on approach. 23 Jul 2014 TransAsia Airways 222 48 10 Taiwan near Magong Airport Crash while landing. 18 Feb 2018 Iran Aseman Airlines 3704 66 0 Iran, near Yasuj Airport Crash into Mount Dena. ^ "ATR delivers 1,000th ATR 72, best-selling regional aircraft in production today Tuesday" (Press release). ATR. 17 July 2018. ^ a b David Kaminski-Morrow (9 May 2017). "IndiGo tentatively signs for 50 ATRs". Flight Global. ^ a b c d e f g "Milestones". ATR. ^ a b c d Sheppard, Ian. "ATR Continues To Drive Turboprop Revolution." AIN Online, 8 November 2015. ^ a b c d Sheppard, Ian. "ATR Creates Leasing, Asset Management & Freighter Unit." AIN Online, 7 June 2017. ^ a b c "Milestones". ATR. 2006. Archived from the original on 17 October 2006. ^ "ATR: record year in terms of sales, deliveries, turnover and backlog" (Press release). ATR. 21 January 2015. ^ Polek, Gregory. "ATR's “Green” Demonstrator Takes Flight." AIN Online, 8 July 2015. ^ Dubois, Thierry. "ATR Studies All-Electric Architecture for Turboprops." AIN Online, 22 March 2016. ^ "Defense & Security Intelligence & Analysis: IHS Jane's — IHS". Retrieved 26 December 2014. ^ "Photos: ATR ATR-42-600 Aircraft Pictures". Airliners.net. Retrieved 26 December 2014. ^ a b "Re-engining ATR could be bridge to 100-seater – CEO". Flight global. 12 July 2016. ^ a b c d Dubois, Thierry. "ATR Wants Better Access to China Market." AIN Online, 11 February 2014. ^ "ATR parent Leonardo rules out 100-seat turboprop". Flightglobal.com. 30 January 2018. Retrieved 7 June 2018. ^ "ATR72 first with carbon-fibre wing" (PDF). Flight International. 19 March 1988. ^ a b Alcock, Charles. "ATR's Record Year Set To Get Better." AIN Online, 11 November 2011. ^ "Dubai Aerospace Enterprise Orders up to 40 ATR 72-600s." deagel.com, 12 February 2014. Retrieved: 15 April 2015. ^ "ATR scores big order at Paris, delivers Avianca ATR 72-600." Aviation International News. Retrieved: 26 December 2014. ^ Francis, Leithen. "Singapore Lessor Orders More ATR 72s." Aviation Week, 19 December 2012. ^ "Avation places $130 million aircraft order with ATR." Reuters, 16 February 2016. ^ Dubois, Thierry. "ATR Sets Sights on China." AIN Online, 14 February 2016. ^ a b Endres, Günter. "IN FOCUS: Recession woes continue at small end of cargo conversion market." Flight International, 26 October 2012. ^ "Iran signs deal to buy 20 more airplanes." The Washington Post, 02 February 2016. ^ "Iran Poised to Buy 40 Regional ATR 72 Passenger Planes." Sputnik News, 16 February 2016. ^ Hepher, Tim (13 April 2017). "Europe's ATR says completes deal selling 20 planes to IranAir". Reuters. Retrieved 13 April 2017. ^ Polek, Gregory. "ATR, Iran Air Seal $536 Million Deal for 20 ATR 72-600s." AIN Online, 11 April 2017. ^ Polek, Gregory. "Iran Air Takes Delivery Of Its First Four ATR 72-600s." AIN Online, 16 May 2017. ^ Polek, Gregory. "IndiGo To Launch Regional Operations with Up to 50 ATRs." AIN Online, 9 May 2017. ^ "ATR 72–600 TMPA: The new generation maritime patrol aircraft for the Turkish Navy." navyrecognition.com, 11 May 2013. Retrieved: 15 April 2015. ^ "Raytheon to provide torpedo integration for Turkish Navy ATR-72-600ASW maritime patrol aircraft". 17 July 2014. ^ a b c d Pocock, Chris. "Leonardo Delivers ATR 72 Maritime Patrollers to Italy." AIN Online, 20 December 2016. ^ "Turkish navy receives first utility-roled ATR 72-600." Reed Business Information Limited, Retrieved: 26 December 2014. ^ a b Perry, Dominic. "Alenia Aermacchi P-72A MPA tests near completion." Flight International, 13 October 2015. ^ a b c "FedEx Express buys up to 50 new ATR 72-600F freighters Wednesday" (Press release). ATR. 8 November 2017. ^ Aircraft Value News (12 November 2018). "Market for ATR72-600s Weakens with Age". ^ "ATR 72–200." Archived 2 February 2007 at the Wayback Machine atraircraft.com. Retrieved: 15 April 2015. ^ "ATR 72–600 startet zum Erstflug" (in German). Flug Revue. Retrieved: 27 July 2009. ^ Polek, Gregory. "ATR 72-600 Wins EASA Nod for High-density Cabin." AIN Online, 8 December 2015. ^ "ATR Cargo Solutions." Archived 8 April 2007 at the Wayback Machine atraircraft.com. Retrieved: 17 November 2012. ^ Thierry Dubois (4 February 2019). "ATR Maintains Its Low-Risk Strategy". Aviation Week & Space Technology. ^ "ASW variant." Archived 2 February 2007 at the Wayback Machine ATR, Retrieved: 17 November 2012. ^ "Naval Air: Twins Rule The Seas." Strategypage.com, 30 December 2008. Retrieved: 20 November 2010. ^ "ATR 72-500ASW." deagel.com. Retrieved: 17 November 2012. ^ "ATR Corporate Version." Archived 14 November 2008 at the Wayback Machine atr.fr. Retrieved: 17 November 2012. ^ "ATR 82 information". Airliners.net. Retrieved: 16 August 2011. ^ "ATR Quick Change." Archived 20 November 2011 at the Wayback Machine ATR, Retrieved: 17 November 2012. ^ "Wings Air Fleet Details and History". Planespotters.net. ^ "AZUL Linhas Aéreas Brasileiras Fleet Details and History". planespotters.net. ^ "Air New Zealand Link Fleet Details and History". www.planespotters.net. Retrieved 19 January 2017. ^ "Mount Cook Airline Fleet Details and History". planespotters.net. ^ "Federal Express (FedEx) Fleet Details and History". planespotters.net. ^ "Swiftair Fleet Details and History". planespotters.net. ^ "Binter Canarias Fleet Details and History". planespotters.net. ^ "Fleet Information (Jet Airways)". jetairways.com. ^ "ASL Airlines Ireland Fleet Details and History". planespotters.net. ^ "Malindo Air Fleet Details and History". planespotters.net. ^ "Air Algérie Fleet Details and History". www.planespotters.net. Retrieved 19 January 2017. ^ "Garuda Indonesia Fleet Details and History". planespotters.net. ^ "Stobart Air Fleet Details and History". planespotters.net. ^ "UTair Aviation Fleet Details and History". planespotters.net. ^ "Bangkok Airways Fleet Details and History". planespotters.net. ^ "Leonardo Delivers First Two P-72As to the Italian Air Force; the Future Guardian of the Mediterranean Is Ready" (Press release). Rome: Leonardo-Finmeccanica. 13 December 2016. Retrieved 13 December 2016. ^ "Pakistan Navy acquires second-hand ATR72." AirForces Monthly (Key Publishing Stamford, Lincolnshire, England), April 2013, p. 26. ^ "News". www.aerodata.de. Retrieved 20 July 2018. ^ Hoyle, Craig. "World Air Forces Directory". Flight International, Vol. 182, No. 5370, 11–17 December 2012. ISSN 0015-3710, p. 62. ^ "Alenia Aermacchi delivers first ATR72-600 TMUA to Turkish Navy." navyrecognition.com, 24 July 2013. Retrieved: 15 April 2015. ^ "Aérospatiale/Aeritalia ATR-72". Flight Safety Foundation. 28 June 2018. ^ "ATR-72 Statistics". Flight Safety Foundation. 28 June 2018. ^ "occurrences in the ASN safety database". Flight Safety Foundation. 28 June 2018. ^ "Accident description of TransAsia Airways incident." Aviation Safety Network (ASN), 30 January 1995. Retrieved: 6 August 2014. ^ "Council-Occurrence Investigations." Archived 26 July 2014 at the Wayback Machine Aviation Safety, Retrieved: 17 November 2012. ^ "ASN Aircraft accident ATR-72-202 TS-LBB Palermo-Punta Raisi Airport (PMO)." Aviation-safety.net, Retrieved: 20 November 2010. ^ "Accident description." Aviation-safety.net. Retrieved: 5 November 2010. ^ "Cuban plane crash kills all 68 aboard." Cbc.ca, 5 November 2010. Retrieved: 20 November 2010. ^ " До 33 возросло число жертв авиакатастрофы под Тюменью Increased to 33 the number of victims of the crash near Tyumen." ITAR-TASS News Agency. Retrieved: 17 November 2012. ^ "Laos crash: 49 dead as plane goes down in Mekong River." BBC News, 16 October 2013. ^ "TransAsia plane crash lands in Taiwan, dozens killed." rt.com/news. Retrieved: 26 December 2014. ^ "Taiwan plane crash kills 48, injures 10." cnn.com, 24 July 2014. Retrieved: 15 April 2015. ^ "ASN Aircraft accident ATR 72-212 EP-ATS Yasuj Airport (YES)". aviation-safety.net. ^ "ATR 72–600 Quick view" (PDF). ATR. February 2017. Archived from the original (PDF) on 12 April 2018. Retrieved 12 April 2018. ^ "ATR-600-Series Brochure" (PDF). ATR. 2015. ^ "Type Certificate Data Sheet No. A53EU" (PDF). FAA. 8 December 2017. Wikimedia Commons has media related to ATR 72. "Launch of a New Generation – ATR 72–600". Global Aviation Resource. 8 November 2009.